5'9" point guard, Isacc "Trell" Baker, signed a National Letter of Intent. He led his Salisbury High School (NC) team his senior season to a regular season conference championship, sectional championship, and a final 27 win - 4 loss record. Baker averaged 14.8 points, 6 assists, 4.6 rebounds per game, and shot 39% from the 3-point line this past season. He scored over 1,000 points for his career at Salisbury High School. Baker was selected to the all-county (Rowan County) and all conference (Central Carolina Conference) three times & was named the Central Carolina Conference male athlete of the year for 2018-2019. He is extremely quick, tough and is really good as a ball defender. Anthony Brown from Sun Valley High School signing his commitment to the DCCC Storm. 6'5" forward, Anthony Brown, from Sun Valley High School (Monroe, NC) signed a National Letter of intent. Brown averaged 15 points, 4 rebounds and shot 36% from the 3-point line during his high school senior season. He is very strong and athletic. Brown’s versatility allows him to play both on the perimeter and in the post. 6’3” shooting guard/forward, Mac Hughes, signed a National Letter of Intent. Hughes played at Northeast Guilford High School (McLeansville, NC) where he averaged 18 points and 7 rebounds per game during his senior season. He rebounds the ball well and is expected to stretch the floor by making shots from deep. Head Coach Matt Ridge (center back) and Mac Hughes (center front) with his family. 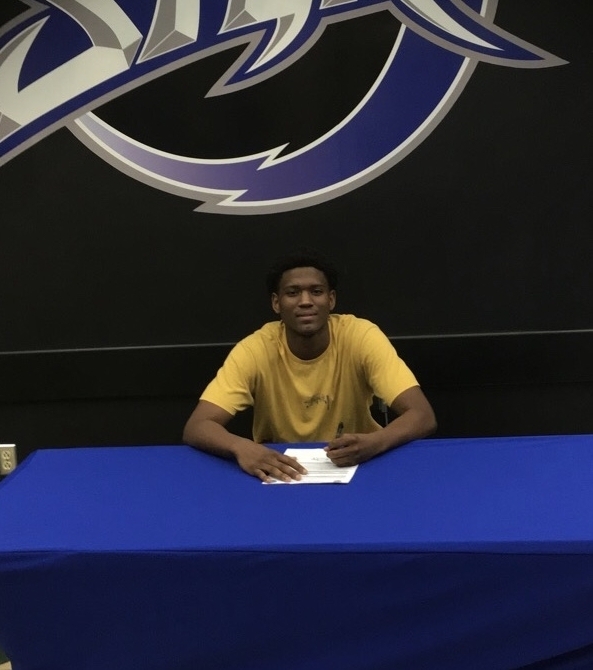 6'5" forward, Romeo Jordan, from St. Pauls High School (St. Pauls, NC) signed a National Letter of Intent. Jordan averaged 13 points, 7 rebounds and shot 41% from the 3-point line during his high school senior season. Head Coach Matt Ridge (center back) and Jermaine Jones (center front) with his family. 6'3" Jermaine Jones, signed a National Letter of Intent. He played for Charlotte Secondary High School (NC). Jones is extremely athletic, a strong defender and very talented at finishing around the basketball. Asst. Coach Dylan Hall (back left), Coach Matt Ridge (back right), Jahlen King (right) and his family. 6'0" shooting guard, Jahlen King, signed a National Letter of Intent. He was named to the All-Metro team in both his junior and senior years at Page High School (Greensboro, NC). He was also selected as the player of the year for both years while scoring over 1,100 points. King averaged 17 points and 5 rebounds per game this past season and helped lead Page to 19 wins while being named to the all-district second team. He also participated in the 2018 triad all-star game. King is a dynamic guard who can put up a lot of points in a variety of ways and is capable of taking over a game. He is capable scoring off the bounce and stretching the defense by making threes. Coach Matt Ridge (back) witnessing Cooper Wall (front) sign his letter of intent. Cooper Wall signed a National Letter of Intent to play for the 2018-2019 DCCC men's basketball team.Wall comes to DCCC from Davie County High School (NC) where he was a standout basketball and football player for the War Eagles. Wall had multiple D1 NCAA schools recruiting him for football before he tore his ACL his junior year. Wall help lead his basketball team to an 18-9 overall record as a senior. THOMASVILLE - On Saturday, June 10th there was a walk down memory lane. As you close your eyes, the sounds you hear in the E. Lawson Brown Gymnasium were like the hundreds of basketball practices played out in the Ledford High School Gymnasium. Brian Hege, Brett Speight, Matt Ridge, Matt Jacobs, Adam Craven, Jason Reich, Scott Dunbar, Ryan Christian and Jason Younts, these were the guys that played for the 1992 2A State Championship against Ayden-Grifton.